A cluster of windmills operate on the north side of Mars Hill Mountain in Mars Hill in January 2007. Members of the Land Use Regulation Commission on Wednesday approved a 19-turbine wind energy project proposed for rural Hancock County. ELLSWORTH, Maine — Maine’s largest wind energy company received the green light on Wednesday to build a 19-turbine wind farm in rural Hancock County but not before regulators attached more stringent noise and financial requirements on the developer. The fate of a second proposal sought by First Wind, however, remained uncertain Wednesday as members of the Land Use Regulation Commission struggled with whether the 27-turbine project would have unreasonable impacts on the undeveloped landscape northwest of Grand Lake Stream. LURC members voted unanimously with one abstention to approve the $78.5 million Bull Hill wind farm proposed for Township 16 MD near Eastbrook. The developer, First Wind subsidiary Blue Sky East LLC, plans to build the facility on roughly 160 acres on Bull Hill and Heifer Hill that will be leased from timberland owner Lakeville Shores Inc.
First Wind’s plans call for larger turbines than typically used in Maine — with a base-to-blade tip height of 476 feet — in order to capture the wind at the site. If operating at maximum capacity, the 19 turbines would be capable of producing 34 megawatts of electricity. “We’re very pleased,” said David Fowler, director of development for First Wind, who noted the company has been looking at the Township 16 site and an adjacent site in Eastbrook for about three years. Fowler said the company still is interested in expanding the facility into Eastbrook. “It definitely is a possibility. But we are not there yet,” Fowler said. 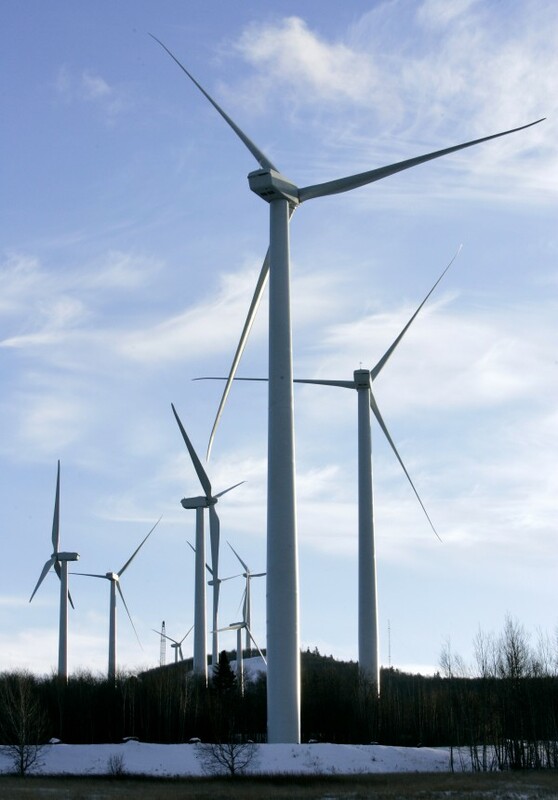 Responding to concerns raised by residents as well as to a wind energy ordinance adopted in Eastbrook, LURC imposed more stringent requirements on the Bull Hill project than have been demanded of other Maine wind farms, including three other facilities run by First Wind. LURC followed the lead of the Eastbrook ordinance and set a maximum nighttime noise limit of 40 decibels at several residences located within the “protected location” zone near the project. That is 5 decibels below the Department of Environmental Protection’s current standard and 3 decibels lower than revised noise standards under consideration for the DEP. Commission members laid out a detailed process for how First Wind would monitor noise levels and respond to complaints. Additionally, the commission required First Wind to set aside more money to decommission and remove the turbines should the project cease operations, mandated the company have the project’s financing lined up before construction begins, and required several years of postconstruction monitoring for effects on bats and birds. Like all proposals for commercial wind farms in Maine, the Bull Hill project faced opposition from some residents and other Mainers who argue that grid-scale wind energy projects spoil the landscape and harm wildlife while generating very little electricity. Lynne Williams, a Bar Harbor attorney representing members of the group Concerned Citizens of Rural Hancock County, said her clients would be disappointed with the ultimate outcome but pleased that more stringent standards were applied to the Bull Hill project. Things did not go as smoothly for the other First Wind project on LURC’s agenda: a 27-turbine wind farm proposed for Carroll Plantation and Kossuth Township on the border of Penobscot and Washington counties east of Springfield. Commissioners had not planned to vote on the Bowers Mountain project on Wednesday but were expected to hold a straw poll to give LURC staff guidance as they draft a recommendation for the next meeting. But after several hours of discussion, commissioners were forced to schedule another meeting for Oct. 19 — likely to be held in or near Lincoln — to settle the issue of scenic impacts. The Bowers Mountain project is located within eight miles of at least eight lakes and ponds. During public hearings and in submitted comments, numerous residents, professional guides and sporting camp owners as well as several organizations representing those groups warned that the 27 turbines would ruin the wilderness experience that draws visitors to the region. Because the project site is located within a zone deemed by the Legislature to be appropriate for wind power development, the commissioners are on a much tighter leash when considering a proposed wind farm’s impacts on the landscape from a scenic standpoint. But the expedited permitting law still allows the commission to consider scenic impacts on resources “of state or national significance” as well as how the wind farm could affect public use of a lake, pond or area. And Pleasant Lake — one of the water bodies from which turbines will be visible — is labeled as an “outstanding” natural resource by the state. Several commissioners obviously were moved by the testimony of residents, guides and sporting camp owners who opposed the project. Commissioner Rebecca Kurtz said it is incumbent on First Wind to demonstrate local support for the wind farm and that the project will not unduly harm the local environment or economy. Kurtz said she does not believe the “meaningless” surveys and aging studies presented by the applicant were sufficient, especially when weighed against the testimony of residents. Saying “the cost of getting it wrong” was too high, Kurtz said she was leaning toward finding that the project would have an “undue adverse impact” on Pleasant Lake, Shaw Lake and other lakes and ponds in the area. “People are not coming here to go to the opera,” said Kurtz, who is from Rangeley Plantation. “This is an area that is completely defined by the natural resources” in the lakes and ponds of the region. Other members expressed similar concerns about the scenic impacts but were evidently not prepared to go forward with a straw vote on the project after considering all of the other criteria. “It’s a big impact but I’m not ready to say no,” said commissioner Sally Ferrand of Beaver Cove. A final vote on the Bowers Mountain project could be held in December.